Views from every window, covered drive isle, HUGE rooftop deck with wet bar & beverage chiller, and tons of natural light, this unit lives like a single family! A 1st of its kind in Englewood, this end unit row home is 1 of 6 on the Corner of Corona and old Hampden...steps from Swedish, Craig, restaurants, pubs, and amenities. Walk to Broadway, Englewood light rail, etc... This home will impress the most discerning buyer. 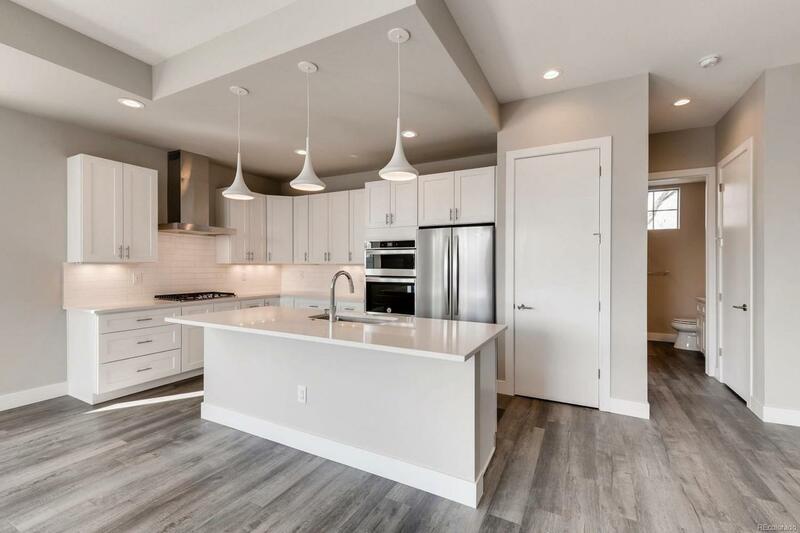 Gorgeous hardwoods flow through the large living/dining/kitchen and compliment the shaker cabs w/soft shut hardware, SS appliances, gas cooktop, and quartz countertops. This layout is perfect for entertaining! Complete with 3 beds/3 baths, walk-in closets, and laundry conveniently between upper bedrooms. In addition to the finishes you'd expect, the builder chose to add wifi enabled garage door, key coded entry, USB charger outlets, under cab lighting, wifi enabled dimmer switches, and tankless water heater. This one has it all!